Last weekend, when I was doing my running clothes shopping spree, there was a pack of NEON nail polish at TJ Maxx. I picked it up, since I hadn't had new nail polish in a while. (My original collection contained pink, blue, and black.) Ryan actually asked me before he left if I would paint my 'upper' nails (yes, he did mean finger nails, he is cute like that) for when he came back. I told him I don't paint my finger nails, just my toe nails. (And honestly the only reason I paint my toe nails is because it makes feet somewhat less disgusting.) I don't think I had painted my finger nails since our wedding, and even then it was just like a ivory/ clear coat. But, since that was Ryan's one request, of course I did it. So now my finger nails are neon pink and my toe nails are neon orange. 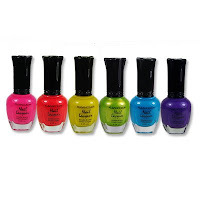 (There is also green, blue, purple and a couple more BANGIN' colors in my 7 pack of polish).